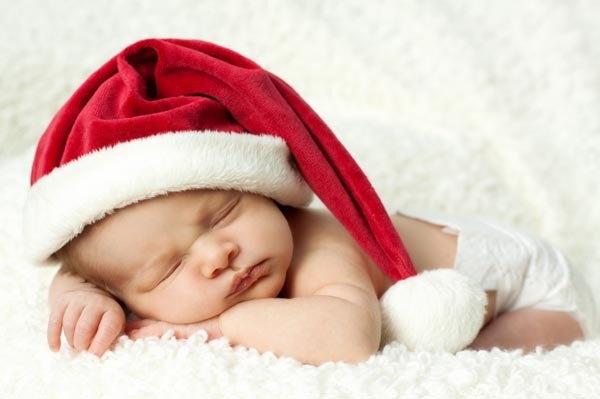 Celebrating your first holiday with a new baby can be overwhelming. But with a little organization and foresight you can get through the holidays stress free as a new family. Everyone from your third cousin Andrea to your husband's great grandma Josie are going to want to get in some time with your new baby this holiday. How can you accommodate them all? One easy way is to hold is open house and ask family members to come to you this year. That way people can come and go as they please and if baby needs to be fed, changed or napped he is in his environment to do so. Let out of towners know they are welcome to come visit, but put some limitations on guests. Make sure all visitors know that your main focus this holiday is baby, so you won't be wearing your tour guide hat. Give them some suggestions for fun holiday festivities in your area and plan to do a few of them together. But if baby is too tired/cranky/hungry to make any of these activities fun (for anyone! ), don't feel obligated to tag along. If there are times when you need a quiet house, be sure to make that known as well so guests can plan their stay/visit accordingly. It's tough to try to do all the holiday festivities, parties, shopping, etc. all by yourself with a new baby. So have a "holiday meeting" with your partner -- and bring your calendars. Mark the days you'll need to arrange for a sitter so you can attend your respective work parties as a couple, note the days guests will start coming in from out town and mark off some time for your new family to do some special holiday activities. Don't go overboard on gifts for baby's first Christmas. He will likely be so overwhelmed by the lights, decorations and wrapping paper that more than a few gifts will just get lost in the shuffle. Instead of dealing with the holiday hustle bustle of shopping malls, order as many gifts for others as you can online and take advantage of seasonal free shipping! Check! Don't let your first holiday season with baby pass by before starting a special new family tradition. From walking around your neighborhood with baby in the stroller to viewing holiday lights to getting your baby's picture with Santa, create a special tradition that you and your family can keep up with and add to as your baby grows.